Ideally suited for pressing and bundling of folded sheets (signatures), brochures, Book- Blocks etc. for Perfect and Hard-Case Binding process. The Hydraulically pressed bundles preserve the fresh/crisp look of the print as it prevents air & dust from spoiling the folded sheets(signatures). It protects the edges and facilitates stacking & storing of the bundles (pre /post gathering /collating) for optimum utilization of space. Push-button/Foot-Switch operated hydraulic system has a built-in Power Saving Device. When the Push Button or Foot-Switch is activated, the motor automatically gets switched-ON. The motor also gets switched-OFF as soon as the pre-set pressure (adjustable upto 2000kgs) is attained. Reset Push Button for release of the bundle and the moving platen returns to its Set-Open Position. Grooves/slots provided on pressure plates of Fixed & Moving Platens for guiding the Tape(Strap/Belt) / Cord(String) and prevent it from getting entangled with the pile of signatures. 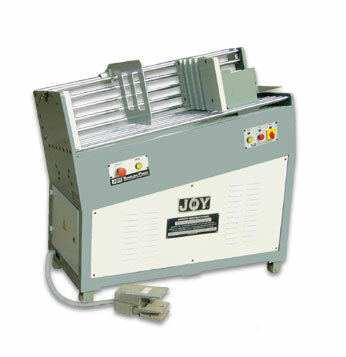 Tray provided on Moving Platen for storing excess length of Cord / Tape / Strap and for placing the End Support Planks (plyboard / hardboard). Clip on the left hand side of the Fixed Platen provided for holding one end of the Tape (Strap) / Cord (string). Motor remains switched off during idle period, the same comes ON when any of the function i.e. Forward / Reset of the Moving Platen is activated. This is a power saving feature. Control Panel is located for maximum operator convenience. Castors provided for maximum space utilisation & mobility.